TORONTO — It didn't take Scott Milanovich long to make changes. 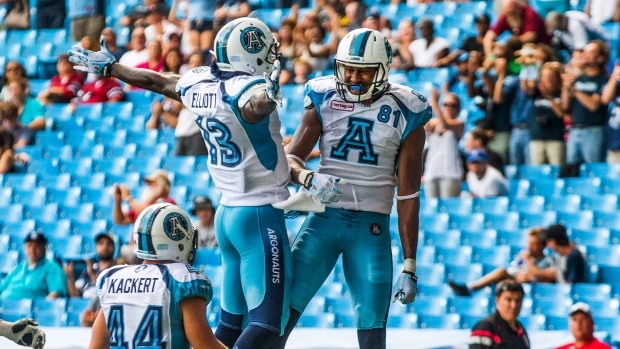 The Toronto Argonauts released American receivers Vidal Hazelton, Kevin Elliott, Tori Gurley and Phil Bates on Monday. The moves came a day after the squad dropped a 38-11 road decision in Montreal, its seventh loss in eight games. After the contest, Milanovich questioned the commitment level of his players and said changes could be coming. "Obviously these decisions are very difficult to make, but I believe they are in the best interest of this football team," Milanovich said in a statement. "We remain committed to winning this year and making a final push for the playoffs." Toronto (5-9) stands third in the East Division standings, two points ahead of Montreal (4-9). Not only do the Argos face the league-leading Calgary Stampeders (12-1-1) at BMO Field on Monday but trail the Edmonton Eskimos (7-7) in the CFL standings. Edmonton is currently fourth in the West Division. If the fourth-place finisher in one division has more points than the third-place team in the other, the No. 4 squad crosses over to take the No. 3 playoff seed in the other conference. Toronto also signed American defensive lineman Eric Martin on Monday. The six-foot-two, 260-pound Martin spent three seasons in the NFL with New Orleans, Cleveland and New England. The moves are stunning as Hazelton, Elliott and Gurley all were starters — when healthy — on Toronto's offence. The six-foot-three, 213-pound Hazelton was Toronto's receiving leader last year with 70 catches for 803 yards and six TDs while being named the East Division's top rookie. The six-foot-four, 230-pound Gurley had a CFL-high 10 touchdown catches with Toronto last season. Gurley, 28, had 36 catches for 509 yards and five TDs in 2016. Elliott, 27, was also in his second season with Toronto, registering 23 catches for 294 yards and two TDs. The six-foot-three, 213-pound receiver recorded 50 receptions for 642 yards and eight TDs in 2015. The six-foot-two, 220-pound Bates had just three catches for 20 yards and a TD this year. He appeared in five games in 2015, registering six receptions for 123 yards and a touchdown.